Dr. Maria Montessori (1870-1952), an Italian physician, educator, and innovator, developed an educational method that builds on the way children learn. As she observed young children in her first schools (Casa Dei Bambini), she came to understand that they possessed an innate ability to absorb information from their surroundings. She named this quality the “absorbent mind.” As the child soaks up every aspect of the environment, including the languages he hears and the culture that surrounds him, he learns “sensorially,” through all of his senses. The birth of her son, Mario, changed her life, as did her experience as a doctor for young children. She dedicated her life to creating an educational philosophy that would nurture the lives of children and provide them with a system of education designed for their developmental needs and interests. She established schools throughout Europe, America and India. Along the way she became an entrepreneur, teaching and manufacturing the beautiful materials that she designed for her classrooms. When she died in Holland in 1952 at the age of 82, she had lived through two World Wars and had witnessed the destruction of the lives of families and children. She was nominated twice for the Nobel Peace Prize for her work in education to bring about world peace. 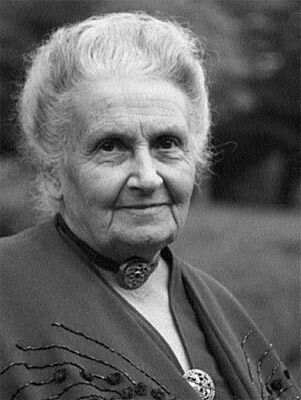 Dr. Montessori recognized that the highest goal of a young child is reached when others “help me do it myself”. Since development during this period focuses on learning to become independent, the corresponding educational environment should support this natural drive, enabling the child to become competent and confident. In a Montessori classroom, the child is guided toward making his own choices, so that he is able to work on what interests him, with appropriate limits. The child thus begins to develop an authentic sense of self. The Montessori approach treats learning as a holistic process, embracing the development of the whole individual by addressing the physical, social, emotional, cognitive and inner needs of the child. Dr. Maria Montessori was a brilliant woman who believed that all children are unique individuals. She was an Italian physician and educator best known for the philosophy of education that bears her name, and her writing on scientific pedagogy. Her educational method is in use today in public and private schools throughout the world.